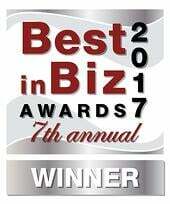 Yealink’s solutions are well known for their flexibility, quality, and affordability. These traits make Yealink an ideal choice for fulfilling a wide range of organizational requirements. Yealink has realized some truly remarkable achievements in a span of less than two decades. As of 2018, the company accounts for over one-fifth of global SIP phone shipments, ranking it the number-one SIP phone manufacturer in the world, and has the largest market share in the European Union. This, along with its strategic partnerships and two in-house R&D centers, has given Yealink the opportunity to obtain a unique insight into the specific needs of the education sector. Yealink has a two-pronged approach to delivering premium solutions to the education sector. First, it has focused on the technology itself. The classroom environment is unique and has specific communications requirements. Features such as paging, intercom, emergency services, and compatibility with third-party speaker systems are all geared towards the educational environment. Moreover, by streamlining the production process and performing much of the R&D and other operations in-house, Yealink has managed to be one of the most affordable IP communications providers on the market. This is an important trait to the education sector, since many learning institutions struggle with limited budgets. Secondly, Yealink has made it a policy to partner with both educational institutions and platform partners to customize and enhance solutions, as well as to integrate its solutions with third-party products and software. Some U.S. educational partners are Insight, CDW-G and Jive, while platform partners include Microsoft, FreeSWITCH and Broadsoft, among others. Yealink also makes its systems more accessible to educational institutions via its Education Reseller Program, as explained below. This program allows certified resellers to deliver preferential pricing and additional specialized services to their customers, including extended warranty services and customer support priority. 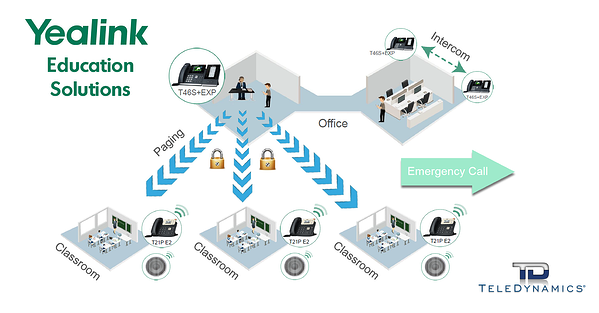 The range of Yealink’s SIP endpoints covers virtually all the needs of any educational institution. The company’s offerings include basic phones for the classroom, high call volume office phones, and highly advanced meeting room conference phones. With a rich feature set among even its most basic phones, each product category provides the needed functionality for each type of use. Features such as large and easy-to-use LCD screens, full duplex speakerphones, support for multiple SIP accounts and codecs, memory keys and corporate directory, as well as compatibility with multiple IP PBX features, including conference calling, call display, call hold, call transfer and call park, are available on all of Yealink’s T4 series phones. More advanced models in the series support Bluetooth, USB, Wi-Fi, dual-port Gigabit Ethernet ports as well as video telephony. 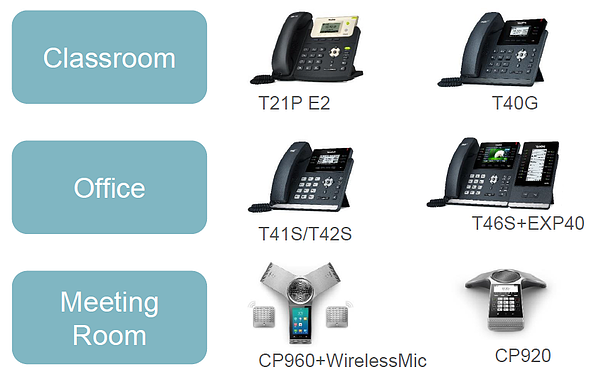 Click here to view or download a side-by-side comparison of the specs for all 10 Yealink T4 IP phone models. Besides the conference and corded phones, Yealink’s cordless handsets provide the mobility needed by some of the more specialized employees of educational organizations, including custodians, security personnel, and technical staff. These phones enable freedom of movement by combining the innovation of IP telephony with wireless DECT technology. With strategic positioning of wireless base stations, these cordless phones can be used from virtually any location across the campus. You can even continue a phone conversation while walking from one base station to another without losing connectivity. The classroom is an ideal place to leverage the advantages of video communications technologies. Yealink’s offerings allow conversion of the physical classroom into a virtual classroom, enabling students at remote locations to connect in real time and be part of the learning session. Additional options of recording sessions and having them made available online for later viewing are also part of this new teaching paradigm. Yealink has developed a robust set of features specifically designed for the educational environment. Paging – All of Yealink’s phones include the capability of password-protected High Definition Voice paging. This feature permits an authorized user to send a page that will be heard from the speakers of all IP phones. Phones can be enabled or disabled to participate in paging, zones can be set up so that particular pages will only be heard from specific phones, and the phones from which a page can be initiated can be limited. Even approved phones require a password for paging to take place, thus restricting the service to authorized personnel only. Intercom – The intercom feature is like the paging feature, but for a single destination. It facilitates direct contact between two single phones at the touch of a button; no dialing is required. This is useful for an executive assistant, or when you are required to page a specific phone multiple times. Emergency services – Phones can be set up to have a button configured to connect with emergency services. This enables a call to be made directly to the security desk or to local 911 services at the touch of a single button. Third-party speaker system compatibility – Because many educational institutions may already have a stand-alone paging system, or may require speakers in areas where there are no phones, Yealink is compatible with both IP and analog third-party paging systems. Systems can be set up as hybrid configurations where pages can reach both the IP phone speakers and the third-party speakers. Video integration – Video is becoming an important part of learning platforms. Yealink supplies a seamless integration of videoconferencing systems into the classroom with cameras and microphones for medium to large classrooms. Add to this Yealink’s meeting server, PC video conferencing software, mobile app, and two high-end videophones, and you have an impressive arsenal of video-enabled devices for any e-learning scenario. For education-oriented customers, Yealink has developed the Education Reseller Certification Program, a program that offers special pricing and services for resellers serving educational institutions. 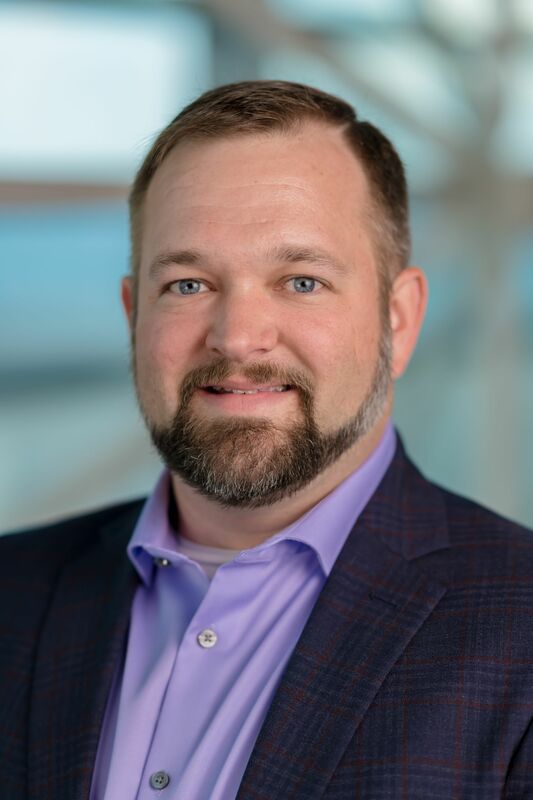 These include a volume-based discount program, free extended warranties, as well as marketing funds and support for vendors focusing primarily on the educational sector. Additionally, strategic partnerships have been forged with companies that provide related software and systems. This means Yealink delivers its services in conjunction with the services of other companies to generate even more value. One such example is its partnership with Microsoft, which has resulted in Yealink’s line of telephony devices that are compatible with Microsoft’s Skype for Business platform. Yealink provides solutions that are ideal for learning institutions at competitive price points, with feature-rich endpoints, unique reseller incentive programs, and strategic partnerships with leading companies in the education industry.